The Irish midfielder has had a difficult campaign with injuries preventing him from featuring so far this campaign. Richie Towell (right) has had an injury-ridden season so far. IT’S BEEN A difficult season so far for Irish midfielder Richie Towell, but he had reason to be positive this afternoon. Having had a nightmare spell with injuries, Towell made the Brighton bench for the first time this season today. The Dubliner has a couple of appearances for the club’s U23 side under his belt, but has yet to add to the two appearances he made last season for the Seagulls after joining them from Dundalk in January. 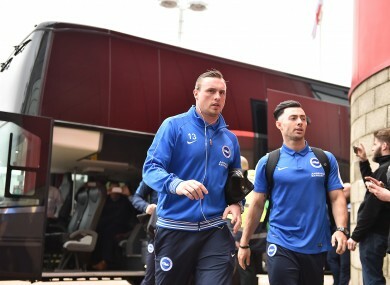 Towell’s return to the first team set-up is encouraging news, however, and he watched on today as Chris Hughton’s side beat Birmingham 2-1 to stay one point off Championship leaders Newcastle, with Irish international Shane Duffy at the heart of the Brighton defence as usual. Elsewhere in the Championship, another Irish international defender, Alex Pearce, was on target as his 75th minute goal earned Derby a 2-2 draw with Fulham. In-form Conor Hourihane laid on another assist as Barnsley secured a 4-3 victory over Cardiff, with Anthony Pilkington on target for the Welsh side. Finally, David McGoldrick got a late winner — his third goal of the season — as Ipswich beat Wigan 3-2. Email “Fit-again Richie Towell makes the Brighton bench for the first time this season”. Feedback on “Fit-again Richie Towell makes the Brighton bench for the first time this season”.